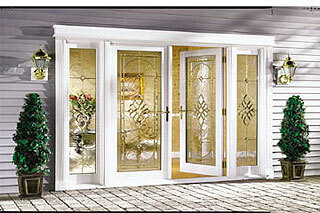 ViWinTech windows and doors are among the best in the industry. ViWinTech realizes that you have choices when installing new windows and doors, therefore it is their company philosphy to offer the highest quality products possible. Vinyl Window Technologies, or "ViWinTech®", is one of the fastest growing vinyl window and door manufacturers in the central United States.Located in Paducah Kentucky, ViWinTech manufactures vinyl windows and vinyl patio doors in a 160,000 square foot plant. ViWinTech's parent company has operated in the building products industry for more than 50 years. In 1987 ViWinTech entered the field of vinyl window manufacturing. Until 1999, ViWinTech manufactured the Certainteed® brand of windows. Then, in keeping with the desire to stay on the cutting edge of the vinyl window industry, ViWinTech found it necessary to leave the Certainteed® window program and introduce its very own extensive proprietary vinyl window and vinyl patio door line. These new window and door lines were born out of extensive market research and feedback from distributors in the vinyl window industry. ViWinTech's management team designed the entire window and door system to meet the challenging expectations of today's market producing an extremely high quality product. This vinyl window and door system is designed to provide lasting energy savings and comfort while enhancing the value of your home. 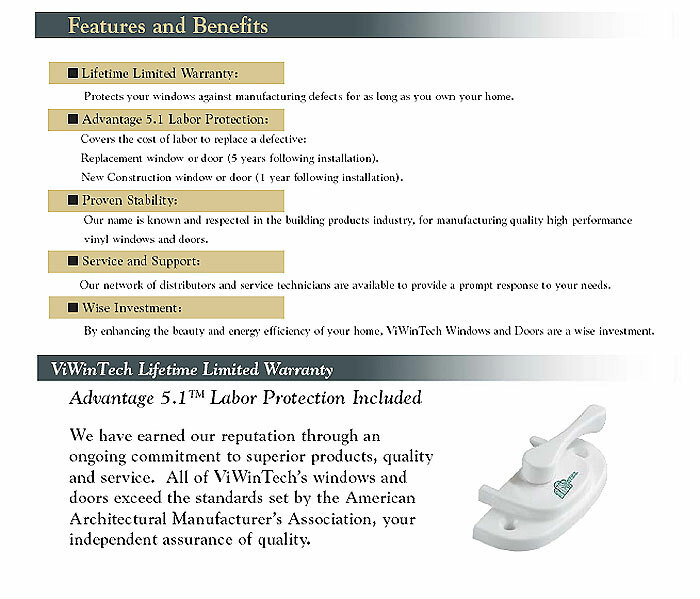 ViWinTech backs this vinyl window and door line with our exclusive Advantage 5.1 Lifetime Limited Warranty, one of the best in the industry. Today, ViWinTech serves 24 states with our own fleet of 53 ft. air ride tractor trailers and other box utility trucks. You'll see our logo proudly displayed as we carry our products to our extensive distributor network of lumber yards, home centers and exterior building product suppliers from Florida to Wisconsin and Oklahoma to the Carolinas.